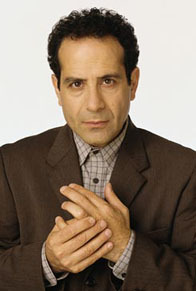 Tony Shalhoub plays the obsessive-compulsive hyper-phobic detective Adrian Monk on TV's Monk with Traylor Howard. In real life, he likes Edgar Allan Poe and says he is frightened by white rappers. He was in two sitcoms before Monk, playing the romantic-minded taxi driver Antonio Scarpacci on Wings with Timothy Daly and Steven Weber, and an eccentric author watched over by editor Neil Patrick Harris on Stark Raving Mad. Among his memorable movie roles, Shalhoub played a short-tempered Hollywood executive in Barton Fink with John Turturro, a temperamental Italian chef in charming low-budget drama Big Night with Stanley Tucci, a DNA broker in Gattaca with Ethan Hawke and Uma Thurman, an amusing caricature of Scotty in the sci-fi-comedy Galaxy Quest with Tim Allen, a very strange pawnbroker in Men in Black with Will Smith and Tommy Lee Jones, a fast-talking lawyer in The Man Who Wasn't There with Billy Bob Thornton, and a delightfully evil megavillain in all three Spy Kids films with Alexa Vega. Though his name is misspelled in the credits for the popular video game Fallout, Shalhoub provided the voice for Aradesh, who wants to tell players that his daughter Tandi has been kidnapped. Shalhoub was born and raised in Green Bay, Wisconsin, where, he says, his family comprised the city's entire Lebanese-American community. He was six years old when he made his first stage appearance, a small role as one of the kids in his older sister's high school production of The King and I. He studied drama at Yale, then spent four years working with a playhouse in Cambridge, Mass. He met his wife Brooke Adams when they both appeared in a 1989 production of The Heidi Chronicles on Broadway, and he made his film debut as the doctor in the AIDS drama Longtime Companion with Bruce Davison. His wife's most famous film was the excellent 1978 remake of Invasion of the Body Snatchers with Donald Sutherland. Her sister, Shalhoub's sister-in-law, is actress and playwright Lynne Adams, who played Rick's mother on The Guiding Light in the 1960s and '70s. His cousin is Chicago disc jockey Jonathon Brandmeier, famous for on-air prank calls, and his nephew, Mike Matzdorff, is a film editor in Hollywood. Most of this extended family was involved in the one film Shalhoub has directed, Made-Up, a little-seen but enchanting comedy about aging women.